UN recommendations to curb sugar intake may face an uphill battle for acceptance, experts say -- confronted by an ingrained human yearning for sweetness. 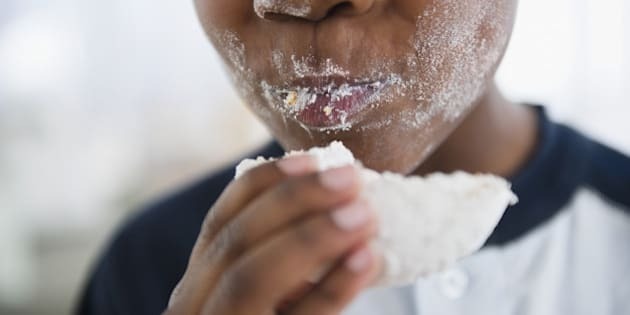 Sugar is laden with energy, which we are genetically geared to want -- a craving the food industry has cultivated to keep consumers coming back for more, they point out. On Wednesday, the World Health Organization (WHO) reiterated its advice that added sugar should comprise less than 10 percent of daily calorie intake, but said consumers should ideally strive for half that amount. Experts question the attainability of these goals, given that sugar is added to everything these days from tomato-based sauces and bread to charcuterie. "There is a collusion between manufacturers and consumers," said Jean-Michel Lecerf, head of nutrition at the Pasteur Institute in Lille, northern France -- pointing to a "shared responsibility" for the sharp rise in added sugar in food. "Manufacturers like to sell their products and consumers like the taste of sugar." The UN guidelines apply to so-called "free sugars" added to food and drink by the manufacturer, cook or consumer, and naturally present in honey, syrups, fruit juices and fruit juice concentrates. These are said to have contributed to a global rise in obesity, diabetes, cardiovascular disease and other health problems. Food manufacturers will be hard-pressed to find a cheaper, easier and more popular flavour-booster, say the experts. Not only does sugar provide a quick energy boost, it is also a natural mood-lifter. "We want it because we get pleasure from it," said Lecerf. "It has a psychotropic effect when you have the blues." Michael Moss, awarded a Pulitzer prize for his book: "Salt Sugar Fat: How the Food Giants Hooked Us", calls sugar the "miracle ingredient for the food companies." "They use it to save money. When you're making a tomato sauce, instead of using naturally red, sweet tomatoes, you can buy cheap, green tomatoes and add sugar to make up for the natural flavour," he said. The food industry has developed a "bliss point" measure for the ideal sugar content — not too little and not too much, said Moss, to make sure consumers are always left wanting more. One of the biggest problems for consumers, he added, was the hidden sugar in savoury products like bread and processed meat. "What it does is create the expected wish that everything you eat is sweet." The UN advice does not cover sugar in fresh fruit or vegetables. According to Nita Forouhi, a nutritional epidemiology researcher at the University of Cambridge, sugar-sweetened beverages may be the "low-hanging fruit" for achieving the UN's objective. The 10 per cent goal amounts to about 50 grammes (1.8 ounces) or 12 teaspoons of sugar for an adult consuming 2,000 calories per day. The average can of soda packs up to 10 teaspoons, so switching to water or a non-sweetened beverage will swiftly cut sugar intake. The tougher five per cent ideal, aimed at reducing tooth decay, will be "much harder to meet," said Tom Sanders, a professor emeritus on nutrition at King's College London. "It would involve not eating cakes, biscuits, confectionary and all sugar-sweetened beverages, including fruit juice," he told Britain's Science Media Centre. Sugar consumption patterns also vary hugely between countries. It accounts for about seven or eight per cent of the adult daily calorie intake in Norway and Hungary, for example, but in Spain and Britain, it is more than double that. On average, South America consumes two-and-a-half times the WHO's 10 per cent recommendation, and sub-Saharan Africans less than the 50 gram goal. "Today's food environments exploit people's biological, psychological, social and economic vulnerabilities, making it easier for them to eat unhealthy foods," said a paper in The Lancet last month. "Regulatory actions from governments and increased efforts from industry and civil society will be necessary to break these vicious cycles." In the global fight against obesity, more than 50 countries now require nutritional labelling on pre-packaged foods, and hard-hit Mexico has imposed a tax on sugar-sweetened beverages. The UN's guidelines are non-binding. The International Council of Beverages Associations (ICBA), said Wednesday the WHO's five per cent goal was unscientific. But, it undertook "... to help consumers to achieve calorie balance through smaller portion sizes, no- and low-calorie beverages and transparent, fact-based nutrition information." Which Granola Bars Have The Most Sugar?